There are a range of neurological diseases in sheep which can feature seizures as a clinical sign. Chemical and plant poisonings, polioencephalomalacia, bacterial infections, nutritional deficiencies (E.g. Vitamin A deficiency, hypocalcaemia), and exotic diseases such as Scrapie can all present with similar neurological signs1. Fortunately in Australia, the Transmissible Spongiform Encephalopathy (TSE) Surveillance program provides funding to investigate such cases, in order to rule out Scrapie as the cause. This allows veterinarians to find answers for producers who might otherwise see little value in investigating small numbers of animals with neurological signs. In this instance, a definitive diagnosis of fluoroacetate poisoning was established, allowing the producer to easily prevent any further losses. A flock of lambing merino ewes was grazing native pasture near Narrabri in North West NSW in July 2017. The ewes were a mixed group of various ages, sourced from various other properties across the district. The ewes had been drenched one week prior (active ingredient unknown), and had not been vaccinated. Those who had lambed had mostly had single lambs with very few twins. The average body condition score of the mob was 3/5. They had been supplementary fed with chickpeas and faba beans, having been most recently fed approximately one week earlier. Three ewes were found recumbent in the paddock and a fourth was found dead. Two of the recumbent ewes had lambs while the remaining one had not yet lambed. When the owner attempted to muster the sheep, the affected ewes ran away from his quad bike, then began to seizure – The owner described the seizures as “heads pulled back, muscles trembling, limbs outstretched and twitching”. When they were left for a period of time they seemed to recover, and he was able to catch them and bring them into the yards for examination. On examination, one of the ewes began to have grand mal seizures and died. The remaining two ewes were ataxic, with marked muscle tremors. They preferred to sit, but could stand when encouraged. One ewe had her lamb with her, but seemed disinterested and wouldn’t let the lamb suckle. Both ewes had elevated respiratory and heart rates. A post mortem examination of the ewe that died was performed. The time since death was approximately 20 minutes, but the ewe already had marked rigor mortis. The myocardium had marked petechial haemorrhages throughout (figures 1 & 2). The rumen contained a large amount of whole, undigested faba beans, many of which were blue/green in colour (figure 3). There was widespread congestion throughout the lungs. The rest of the post mortem was unremarkable. Further questioning of the owner revealed that he had recently baited for feral pigs with faba beans treated with 1080 (fluoroacetate). It was suggested that the ewes had gained access to this baited feed. Samples were submitted under the Transmissible Spongiform Encephalopathy (TSE) surveillance program. 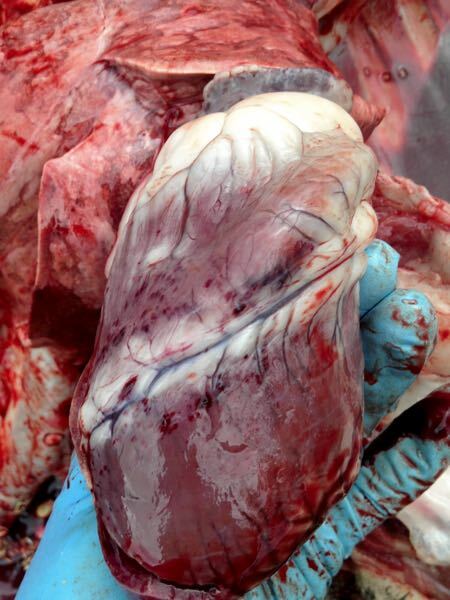 Histopathology showed “acute, multifocal, moderate myocardial degeneration and necrosis… suggestive of an acute event of cardiac toxicity”. Chemical residue testing on the pooled liver and kidney returned a reading of 0.06mg/kg fluoroacetate. The ewe was TSE negative. Blood collected from one of the remaining live, affected ewes showed markedly elevated CK (39085 U/L (normal 0-300U/L)) and AST (665 U/L (normal 0-130 U/L), suggestive of muscle damage. The producer treated the remaining two animals with fluids and supportive care, but both died over the next 2 days. No other animals appeared to be affected. Figure 3. 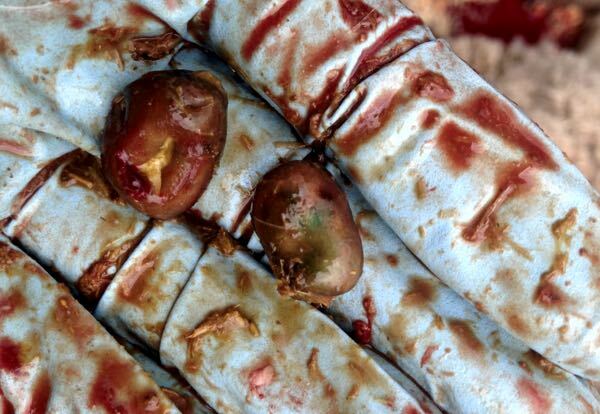 Whole, undigested and dyed faba beans found within the rumen. Synthetic fluoroacetate, or sodium monofluoroacetate (1080) is widely used in the control of feral animals in Australia. Unfortunately, it is not entirely species specific4, and livestock who gain access to baited feed suffer the same fate as the intended targets. Fluoroacetates are also found naturally in certain plant species, but toxicities are much more commonly seen due to the synthetic compound3. Fluoroacetates cause overstimulation of the central nervous system and alter cardiac function, leading to circulatory collapse and/or death by convulsions 3. Signs may appear when animals are driven, and death usually follows in a few minutes to a few hours2. Ruminants often show no obvious signs of poisoning until their sudden collapse4. Diagnosis is based on clinical and post mortem signs, rumen contents, history of access to the chemical and analysis of muscle tissue, liver, rumen contents or kidneys for fluoroacetate compounds3. 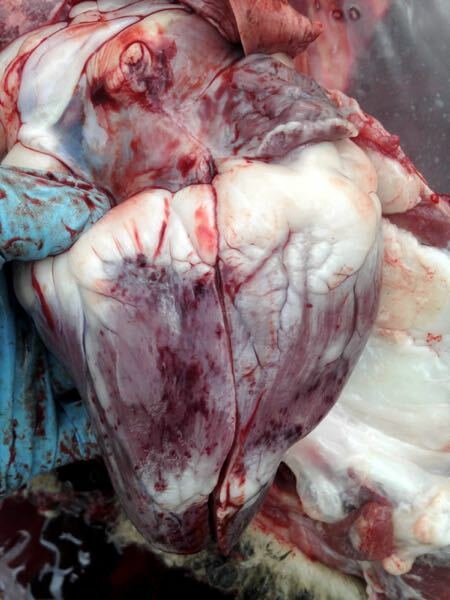 Haemorrhages on the myocardium and a rapid onset of rigor mortis, both seen in this case, are common post mortem findings 3. The heart may also be “flabby”, with oedema and congestion of the lungs, along with generalized venous congestion2. In this case, the finding of whole, undigested faba beans of the rumen was the lightbulb moment for the producer, as the sheep had not been fed beans for over a week. The reported lethal dose of 1080 in sheep and cattle is between 0.2 and 0.6mg/kg4. Samples from the deceased ewe in this case showed only 0.06mg/kg, however the levels in the body may still have been rising if the ingestion was very recent. Any level of fluoroacetate detected is considered abnormal. The prognosis for affected sheep is grave and animals rarely recover3, as seen in this case as all affected animals died within 48 hours of the initial investigation. Treatment is symptomatic and supportive, but unlikely to be effective3. Fortunately, prevention is relatively easy as long as fences are maintained in a stockproof condition.